Not my actual bathroom. Unfortunately. Ritual purification, or ablution (from the Latin word ablutio, "washing away") is present in many cultures and religions. It can take various forms, some of which are rather drastic, and like all things it can be taken too far and hurt rather than help, but it's an idea common to humanity: that cleaning our body can be an act of spiritual importance, an act preparing us for other important activities, or just an act making us as we should be. In some systems, the act of ritual purification is related to the idea of inherent human unclean-ness. These religions consider the human body to be something ignoble and bad (or evil), and establish strict purifying rites in an effort to "detach" people from those bodies, to strip this simple, material humanity away. I do not subscribe to this idea, and I strongly suspect neither do you, Readers, so we won't worry about that. All this means that you basically have a ready-made ritual structure that only needs a few things to turn it into a spiritual practice. The most important of those is, of course, your intention. Actually, that's the only indispensable thing: if you intend for your bath-time to have spiritual significance, then it has. But some additional actions (and/or accessories) can strengthen that intention, make it more visible, more grounded and more fun. Using candles for baths is a no-brainer. 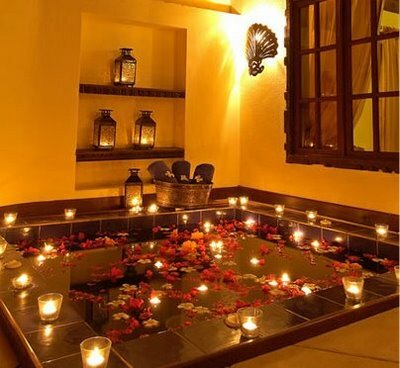 Candlelit baths are a staple of romantic evenings, but also in aromatherapy or anxiety treatment. The simplest, most mundane idea behind it is this: you don't normally use candle light in your bathroom, so when you do, it automatically becomes exceptional. QED. In witchcraft, of course, candles have much more importance. Using a specific number, colour or setting of candles, we can represent all sorts of ideas that we want to incorporate to the bathing ritual. Protection, soothing, cleansing? Or maybe preparation for further rituals? You decide. The essence of bathing is cleaning your body through immersion in water. (Thank you, Captain Obvious!) This means that you can easily immerse yourself in whatever it is you add to your bathwater, and this gives a really wide array of possibilities. A herbal mixture or a portion of baths salts done with a specific intention in mind and added to the water is the most common way of "ritualising" a bath for all sorts of purposes, especially for spells that are meant to act on you: heal you, protect you, help you. And if you choose the right herbs, a bath can heal you in ways completely unrelated to magic, too. You can also give spiritual significance to your baths by working out a system of washing your body. Do you start with your feet and work your way up? Or do you wash your face first? Maybe you want to start with the more intimate body parts? All this can have a meaning that will make your ritual baths more special. Since this is a really broad subject, I'll stop this introduction here. Part 2 is here.